The Album Of The Week is "Serpents" by Struck By Lightning. Hailing from Columbus, Ohio, STRUCK BY LIGHTNING features Gregory Lahm (previously of Mouth Of The Architect) on vocals and guitars and is accompanied by fellow Columbus-ites Travis Kline, Mike Leach and John Peters. STRUCK BY LIGHTNING s Translation Loss Records debut Serpents serves as an ode to the fist pumping-basement punk rock of old, encompassing the aggression and crust slathering s of His Hero Is Gone and Disfear with the progressive rock and metal acrobatics of Mastodon and Big Business! 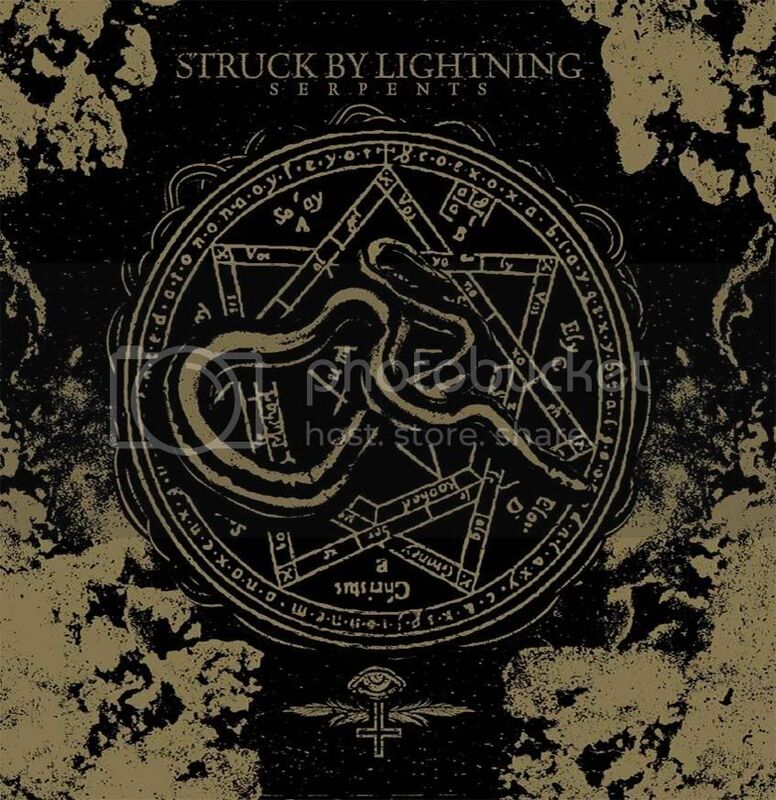 With long time Mouth Of The Architect producer and engineer Chris Common at the helm, STRUCK BY LIGHTNING has created a ferocious and hairsplitting album full of blistering aggression that will undoubtedly take the world by storm. "Ohio's Struck by Lightning has gotten off to a rather impressive start. Their debut record, Serpents, is far more focused and fine-tuned than many debuts, a fact that might be attributed to Gregory Lahm's leading presence (Lahm's previous claim to fame was being a part of Mouth of the Architect's The Ties That Blind-era line-up), but it may also be linked to the reasonable assumption that these four dudes have simply put in a ton of listening hours with High on Fire, Mastodon, Disfear records. Serpents is a blend of all three, throwing together equal doses of sludgy grit, intelligent riffage, and punk rock fervor. In a way, it shares a lot of similarities to Kylesa's early, more crust-punk influenced days. The musical path isn't exactly unbeaten, but due to the anthem-like qualities of so many of these tracks, it's hard not to get excited about these guys. The formula here isn't terribly complex, as up-beat tempos, punk-influenced crossover drumming, and driving bass lines anchor the majority of the tracks. Leadoff track "Silent and Still" immediately hooks the listener with a strong melodic hook that leads into riffs sporting slightly thrashy rhythms. But it isn't until the track's first chorus that we are shown the disc's greatest asset: highly catchy, anthemic vocals. Serpents is densely populated with soaring, harmonized yells that are capable of upgrading even the most straightforward metal riff into something of near-epic proportions. "Supercell" and "Widowmaker" also stand out as record highlights. Both sport energetic d-beat backbones and thick metallic riffs, proving that when they do find that sweet spot in between Disfear's and High on Fire's songwriting styles, great things can happen. The only missed opportunity on the record is the limited variability in song structures. Aside from the interlude "Collection of Teeth," "Becoming Earth" is the only track that noticeably switches gears and plunges into slower, more groove-oriented territory. Playing around with the style might not have been one of the band's primary goals, but the song's main bass line alone is enough to warrant more activity in that songwriting area. Yes, the aforementioned sweet spot is definitely Struck by Lightning's bread and butter, but if one or two more tracks with the mentality of "Becoming Earth" were included and some of the more punk-oriented tracks were slimmed down (most hover around four and a half minutes, which can feel a little long at times), Serpents would emerge more well-rounded and stronger. After all, that variability is one of the reasons that High on Fire's Death Is This Communion turned out to be so fantastic. Am I requesting that Struck by Lightning follow one of their greatest influences even more closely? Not quite. But I am hoping that in the future these dudes capitalize on some of those massive grooves that "Becoming Earth" hinted at to produce an album that destroys on more than one front. I gave it a listen. Pretty solid stuff. Not amazing, not horrible, just solid. Good pick.